Al Falah University hosted the Emirates Association for lawyers and legal experts on Monday, 25 April 2016, to give a lecture to the students of College of Law at the University. The aim of the lecture was to introduce the association and its role in spreading legal awareness through the issuance of research and legal books, in addition to the training courses offered by the lawyers. This Association was founded in 1980, under the name of "Jurists Association" on April 30, 2012 under the patronage of His Highness Sheikh Khalifa bin Zayed Al Nahyan, President of the UAE. Their Highnesses Supreme Council Members and Rulers of the Emirates later renamed it to "Emirates Association for Lawyers and Legal Experts". In the course of this informative activity, Mr. Ahmad Muhammad Al-Hosni, legal researcher at the Ministry of Labor and a member of the Community Service Team of the Emirates Association for Lawyers and Legal Experts, provided a quick overview of the display assembly where all the various programs and activities, conferences, seminars and training courses had been conducted by the Association, locally, regionally and internationally, which have contributed to the promotion and development of justice and the judiciary in the United Arab Emirates. On the same context Ms. Eman Rifai, Head of the Innovation team in the Association pointed out all the details of the courses offered for students to graduate as lawyers. She indicated that this Association is headed by a group of highly professional Emirati lawyers. The students also had the privilege of interaction with one of their researcher and legal trained lawyer, Ehda Mohammed, about her personal experience of being an Emirati lawyer. 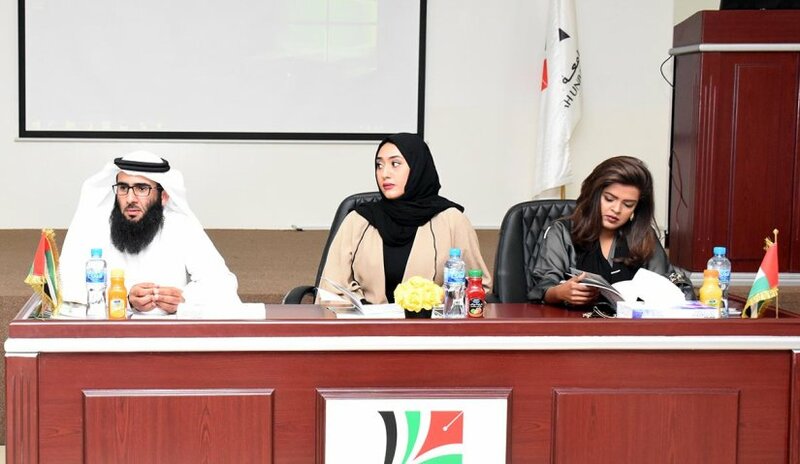 At the end of the lecture, the community service team at the Emirates Association for Lawyers and Legal Experts answered questions raised by the students.